The Italian Senate's Immunities Committee has recommended that Silvio Berlusconi be ousted from parliament as a result of his recent tax fraud conviction. The Committee will now submit a motion to the full Senate for approval within the next 20 days. The final plenary vote is supposed to be a mere rubber-stamping exercise, so we wouldn't expect any surprise. The expulsion from parliament would certainly be a hard blow for Berlusconi, but wouldn't mean the end of his political career. With all due differences, comedian Beppe Grillo has shown that it's fully possible to lead a party from outside parliament. Most importantly, Berlusconi's large public support is unlikely to evaporate overnight. In the eyes of many Italians, Il Cavaliere remains the example of a successful self-made entrepreneur - and the victim of a conspiracy of left-leaning judges. Indeed, once the process to expel him from parliament is completed, Berlusconi will find himself with a couple more trials under way - and no more parliamentary immunity. However, he remains unlikely to spend any time behind bars because of his age. That said, the key aspect at this stage is perhaps what will happen to Berlusconi's party in the near future. As we noted in our previous blog posts, the confidence vote in the Italian Senate earlier this week triggered a mutiny that ultimately forced Berlusconi to an unexpected U-turn. Things seem to have cooled down a bit, but the risk of a party split off the back of Wednesday's rebellion remains. This would be a bigger setback than the loss of a seat in parliament. On a more general note, one of the reasons why Berlusconi still looks likely to remain a rather influential figure in Italian politics is the lack of an obvious substitute to take the lead of Italy's centre-right forces. So far, Berlusconi has to a large extent, either by hook or by crook, been able to keep his side of the political divide together. The day he leaves the stage, we may well witness the fragmentation of that side of the Italian political spectrum. The impact of such a split on the country's political stability is difficult to predict at this stage. It is a bit like the Arab Spring: a thing that is simply very likely going to happen. And with Mr Bunga of course certain to happen. However where most people go wrong is that they think that it is sure that that will be a positive (a short term positive to be exact). Like 'all change is positive' and what we really, really want will actually happen. Silvio is gone problem solved. Simply works not that way. He will be close to history seen his age and the fact a lot of his people are dropping him, but first of all he could go out with a bang. Not likely in a democratic system btw. The system still has too many checks and balances. The alternative ('the solution') people want and subsequently think they will get often simply isnot the solution they actually get. In the Arab Spring the West wanted nice educated, modern, young, secular, open minded etc people at the helm. What they actually got was guys with beards who only read one book in their whole life with as hobbies stoning women and chopping heads off. Not unlikely that that will follow Berlusconi. His party has no successor who will work with the electorate. Looks simply room for a real populist Geert Wilders style. Also a possibility btw not a certainty. However it simply looks like whatever the consequences might be it is a step Italy will have to take. Hard to imagine a prosperous country in say 2050 with still guys like Berlusconi and Grillo getting 2/3 of the vote and the rest being as dysfunctional, corrupt and incompetent as the bunch now. The country will have gone for the dogs long before that. They need change (of the not Obozo kind, but the real thing). His supporters are of course simply right when they state that it is a bunch of left leaning judges and prosecutors doing this. And these judges hardly do their country a favour at this moment in time. They simply make a dysfuctional political system even more complicated and dysfunctional. However they forget that being corrupt and incompetent is one thing (and a bad one) but putting it every day on the frontpage (also internationally) as Berlusconi does and showing he can get away with it is another. He is simply the first one to take on simply because of the media exposure. If it was a good strategic move by these judges is another one. Of course they better had taken some guys they could actually handle and get behind bars. Now the look for well over a decade as a bunch of incompetent clowns themselves. Made even worse by the fact that Berlusconi is portrayed as a clown in a lot of the BBCish/Guardianista-like Italian media. Being serial outsmarted by a proclaimed clown makes you look like a bucket full of Bidens or Rajoys. Will hardly work as crime prevention. OE is really great in reporting on this. 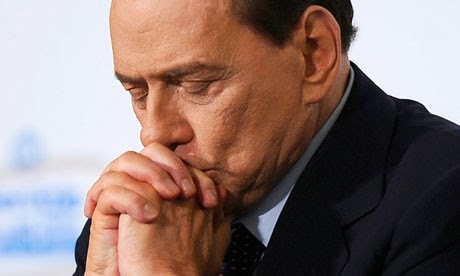 >90% of the media is simply fully Silvio-out focussed and totally has lost the perspective. Even the quality media. What makes it even better that it is via a blog where things 'get public' within a few hours without time to properly discuss or overthink it. Very few weaker posts. Another strong point where >90+% of the media go wrong is that OE knows how to implement fields that are not the main field of expertise in a post. Most of the time you see say economists analysing political/legal issues with economic logic. And go completely the wrong way. A guy like OEs Raoul could (and should) be a template for the the economic community in this. He knows exactly how far he can go with areas that are not his expertise and bring it to a practical result. Nearly all of the stuff of not the top 3 or so banks is absolute crap compared to that. Italians have chosen all sorts of crap as their leaders basically since Adam and Eve it is simply hard to imagine that that will stop because of this. He his 10s of scandals behind his name that each seperately would have killed somebody in Sweden or the UK politically. Italians simply donot seem to care. Looks simply very unlikely that this time it will be different. Also seen the surrounding conditions (no alternatives and his media power). Basically Italians now have 3 choices. There are of course more but those donot seem realistic and of course there are outside the system choices like not voting and emigration. But in the ballotbox it is basically one of this 3. All are fully in the Italian tradition crap. It is therefor more the issue of what is the alternative for Berlusconi? There might be candidates in his own corner, but as far as I have seen them they will be as attractive as used toiletpaper to most voters. Left has basically similar dysfunctional issues overall only less in the open. Letta looks an appealing candidate. But more important in that respect. The left has clearly no solutions for the crisis either and voters hardly (nett) move in mass from left to right (or the other way around). Grillo is a populist. Which in itself will not attract a lot of people. Plus a change populist (not a social conservative like Farage or Wilders or LePen). Simply next to having no credible organisation simply not appealing to mainly social conservative right voters. In election you only have to beat the ones that come up against you. People imagine all sorts of ideal candidates and policies however when there is an election it is the choice between the same sort mediocre people. From there Berlusconi still looks like a real alternative. Who will you otherwise vote for on the right. A new guy with no appeal and no media backing (right)? The left with no answers and probably wanting to hire more low or no added value civil servants? Or a clown? Berlusconi is a fighter and a survivor. Of course this scandal will give a hit to his popularity. And people are finding out more and more that he is not the answer. It will unlikely be as in his prime. But at the end of the day when it comes to voting there are no real alternatives on the right. And further more, the rest (non right) is crap as well, only in another way. Especially in times of crisis you see people often going for the devil they know. He therefor imho will very likely remain a force to be reckoned with. Only in a slightly different position. But Grillo has already shown how that should be done. As far as that issue is concerned his age is probably a bigger problem for him. The brain keeps working into the 80s when you are lucky, but he needs the fighting spirit as well as that is his style. He needs both and likely somewhere his health will start to play up. Anyway remember as well that half or so of the media attention will remain going via his media. Even when he was no direct politician he would be an important player. He simply is Italy's UberMurdoch. He will almost certain in one capacity or another remain a force the next coming years. The right however will likely be in a transitional phase. Simply unable to really go to a next post-Bunga age. How that will play out is more difficult to judge. All sorts of things might happen which we cannot foresee now. Unlikely it will do them good in the ballotbox one way or another. The rest of the party (the deserters mainly) have to find a new modus operandi to work with him. As said completely dropping him will be nearly impossible. They have chained themselves at him when it was advantagious. With his media power and the powerbase he still has in the party it will be simply impossible to give him some flowers and a new pen and wish him all the best in the next stage of his life. I donot think however they fully realise that yet.